Tibialis anterior tendinopathy is inflammation, or degeneration of the tendon, or tendon sheath, of the tibialis anterior muscle causing gradual onset pain and stiffness at the front of the ankle. Treatment involves reducing pain and inflammation, managing training loads and correcting any biomechanical problems of the foot. Symptoms of tibialis anterior tendinopathy include pain and stiffness at the front of the ankle, particularly when bending the foot and toes upwards. There may also be swelling and redness over the front of the ankle along the path of the tendon. Pain will get worse with increased activity, particularly running or walking up hills. A creaking feeling (called crepitus) can be felt when pressing in on the tendon (palpating) when moving the foot up and down. There may be weakness lifting the foot upwards which may result in a foot drop or slapping gait. Specific tests to help diagnose tibialis anterior tendon injuries include resisted dorsiflexion, where the therapist will resist the patient attempting to lift the foot up (dorsiflexion). Or resisted eccentric inversion where the therapist moves the foot from inversion to eversion whilst the patient resists, trying to keep the foot inverted. Pain at the front of the ankle on either of these tests may indicate tibialis anterior tendon pain. An ultrasound scan or MRI scan may be used to confirm the diagnosis and rule out a strain or tear of the tendon. 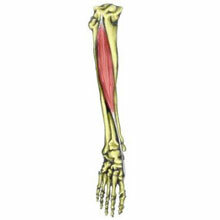 The tibialis anterior muscle is the large muscle that runs down the outside of the shin and connects to the foot via a tendon which passes across the front of the ankle and attaches to the inside of the foot. The tendon can be felt at the front of the ankle, especially when the muscle contracts to lift up (known as dorsiflexion) and inwards (inversion). Inflammation of the tendon itself or the tibialis anterior tendon sheath that surrounds the tendon can arise through overuse particularly through running on hard surfaces or in racket sports where you have to change direction frequently. Tendinopathy is probably a more accurate term that tendonitis, particularly in long-term, chronic injuries. Tendinopathy describes degeneration of the tendon which is likely to occur through repetitive stress over time, whereas tendonitis is acute inflammation. Overuse is the main cause but there are factors which can increase the chance of incurring tibialis anterior tendinopathy or tendonitis. Running up and down hills means the tibialis anterior muscle has to work harder. When running up a hill the muscle must lift the foot higher than normal. Running downhill means the tibialis anterior muscle is working eccentrically, which means it is lengthening at the same time as contracting, placing even greater loads through the muscle. Rest and apply the PRICE principles of protection, rest, ice, compression and elevation, until there is no pain. Apply ice or cold therapy for the first two days. Cold can be applied for 15 minutes every couple of hours, reducing the frequency as pain allows. After an initial, acute inflammation has settled down, applying heat and use a heat retainer type ankle support may be more beneficial. Put padding into the shoe if it is pressing on the tendon at the front of the ankle, aggravating the injury. When pain allows exercises to stretch and strengthen the tibialis anterior muscle can begin, particularly resisted eccentric inversion. The aim is to gradually increase the load through the tendon so it can cope with normal training. A doctor may prescribe anti-inflammatory medication e.g. ibuprofen to help reduce pain and inflammation. For severe cases, they apply a plaster cast, although this is rare. If a severe tear to the tendon is diagnosed then this may require surgery. Any biomechanical problems of the foot should be identified and corrected with Orthotic foot inserts. If the foot overpronates (rolls in or flattens), then this will mean the tibialis anterior muscle has to work harder and stretch further as the arch of the foot flattens. Cross friction sports massage applied to the tendon may help with chronic cases. To stretch the tibialis anterior muscles the athlete kneels down sitting on their heels. Gently push down on the heels to feel a stretch the front of the lower leg. Hold the stretch for 10 to 20 seconds and repeat 3 times. To increase the stretch do one leg at a time and lift up the knee of the stretching leg. Strengthening the tibialis anterior muscle must be done very gradually. As this is an overuse injury, going too hard at the strengthening exercises could make things worse again. The aim is to gradually increase the load on the tendon so it can cope with normal training demands. Repeated foot raises in a sitting position will work the tibialis anterior muscle. Probably a better exercise is resisted eccentric inversion. The therapist moves the foot from an everted position to an inverted position whilst the patient attempts to resist the movement.